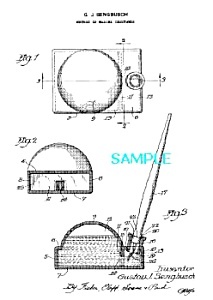 1930s Patent document for the Inkwell [Matted For Framing] for design of a Method of Making Inkstands. This wonderful patent reproduction of the original patent graphic is crisply printed on luxurious Ivory Parchment Paper and is the perfect to go with the piece itself. It includes a white acid-free matte and is ready for insertion into a standard 8" x 10" frame for hanging. Graphic area shown is 4 1/2" x 6 1/2". Also, included are the remaining pages of the Patent Document printed on 20# white bond paper to complete the Patent information for the collector. Image of patent included here is low-quality for quick loading on the net with SAMPLE written across, which will not be on your print. Your piece will also include the actual patent number and date. All Patent Information has been reproduced from the USPTO documents. S&H included in the US.